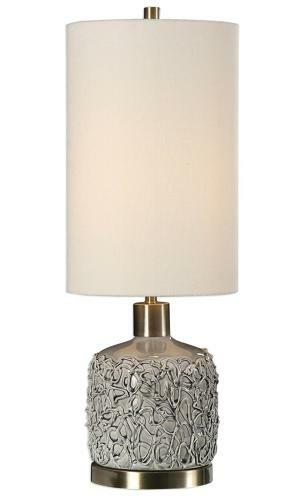 Decorative grey ceramic, featuring hand applied ribbon like details, with heavily antiqued brass plated accents. The tall, round hardback drum shade is a white linen fabric with light slubbing. Due to the nature of fired glaze on ceramic lamps, finishes will very slightly.